Adam Silver is auctioning off a one-on-one lunch with him and other senior executives at the NBA offices. After four short months after being appointed NBA Commissioner, Adam Silver has already made a name for himself. His uncompromising approach to the Donald Sterling controversy has earned him praise and respect among many, promising an interesting tenure to follow. Now, Silver is offering up the chance for two fans to ask him their burning questions through an online auction at global charity auction site Charitybuzz – and the price is getting steep. 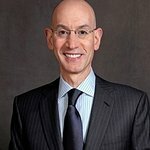 Fourteen people have already placed a bid on the chance to break bread with the Commissioner and other senior executives at the NBA offices in New York City, raising the price of this power lunch to $12,500 in just six days. With over two weeks to go, that number certainly won’t stick for long. Fans can get in on the action here through May 22. The auction is part of an effort to raise funds for the Advertising Council, a nonprofit organization that works on public service campaigns for nonprofits and government agencies. Charitybuzz raises funds for nonprofits by auctioning thousands of incredible experiences spanning the best of sports, celebrity and pop culture. Since launching, the company has raised over $100 million for charity by giving bidders the chance to live their dreams and make a difference.